Love this bed. Exactly as pictured and wasn't hard to put together. Very happy with this purchase! The Baffin Upholstered Platform Bed offers a premium look at a value price point. Neatly tailored linen over a padded, wood frame is complemented by sleek, solid wooden feet finished in an espresso. The Baffin has two rows of striking nail-head trim. Intelligent nested leg packaging makes for efficient shipping and storage. Fits queen size beds. The platform bed includes headboard, footboard, and side rails with a modern, euro-style slat system that eliminates the need for a box spring. All hardware is included. Rize by Mantua Manufacturing. The set up was incredibly easy the bed is super sturdy. The nail head detail and headboard itself are beautiful. It definitely is lower, since it is a platform and no box spring is required. You could add a box spring to make it higher though. I absolutely love love love this bed! The bed came in two separate boxes. One containing the headboard and a few prices that we're stored inside of it ( so make sure you check the inside of the headboard thouroghly), and the other box had the side and end peices and the wood that goes from side to side. The bed was very easy to put together and the directions were very self explanatory. It is made of a very sturdy material and the fabric is also high quality. You can look like you sleeping like a king or queen at a very affordable price. The bed got to me within four days of ordering and was in great condition when it got delivered. 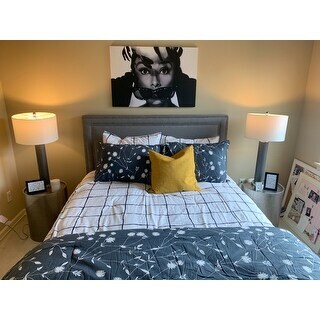 I would highly recommend this bed if you are looking for a change in look and style in your bedroom. It is a beautiful color gray and easily matches with whatever color designs you might choose. I give this a definite 5 star! Easy to put together and looks great in our guest bedroom! I was also surprised how sturdy this is. Doesn’t make any cracking noises when you move your body like our old frame which by the way, cost twice as much as this one. We absolutely love the Baffin platform bed we purchased. Not only is it beautiful, but it's structure is quite sturdy. It exceeded our expectations. Combined with a memory foam mattress, it is the perfect addition to our bedroom. Overall, good value for money. Build quality and instructions are decent for its price point. Buyer should know headboard and platform bed come in 2 different packages and shipments. This is an absolutely gorgeous bed frame. Went together quickly and easily. Very good instructions. It is very sturdy. The grey linen-look is beautiful and the nailhead trim really sets it off. I would recommend this item to anyone. This bed is absolutely beautiful. 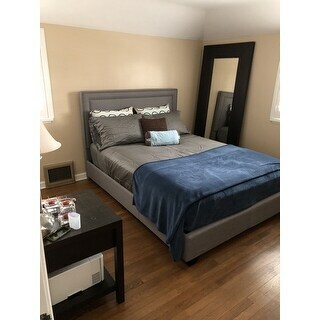 Not only does it look very expensive, it was also easy to assemble and I love that you do not need a box spring for it. Love the height of the headboard. Looks just like it does in the pictures. Quality of the fabrics feels pretty good. Directions were slightly confusing since there’s 2 different sets other than that it took about a hour with 2 people. The wooden slats are about half the thickness of my previous bed so not sure how well it’ll hold up. So far it seems to be sturdy. Doesn’t creek and held up just fine during “fun time”. I wouldn’t recommend pushing too much on the headboard though. There is some room for storage under the bed too. Giving it a 4 only because I don’t know how well it holds up yet. This is a nice bed for the price. Pretty similar in quality to other more expensive platform beds I have bought in the past however the hardware provided is pretty flimsy. I have replaced mine and everything is fine. easy to assemble (instructions were clear, however, so many parts) looks exactly as the photo! Great quality and i would order again if needed! i did not have to use a box spring. I just put my mattress ontop. Looks great and you can still see a lot of the headboard (like the photo). Item shipped extremely fast! 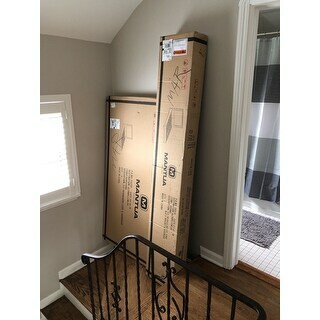 Ordered this item Thursday evening, bed arrived Saturday morning. The bed comes in two large boxes and was extremely well packed. It took me about an hour and a half to assemble and everything went together with ease. I am pleased with the quality of this bed. My daughter will be seeing her new room for the first time since went back to school after the holidays. I am extremely excited and believe she will love it and her new queen sized bed. What a great platform bed! I bought this one for my teen son's bedroom. Looks nice and neat and he loves it! Great quality, great color (we bought gray). Took 1 person 2 hours to put together not because it was difficult, but there are many parts. Would buy again. I recently ordered this platform bed. I was a little overwhelmed at first when I saw all the parts. I was thinking there was no way I could put this together myself but I did it. It took me a couple hours but it was a lot easier than I thought it would be. It looks fantastic all set up. It was worth the price and I would recommend to Family and friends. Pros: sturdy, no box spring Cons: needs to be about 6 inches taller. The grey is too dark for my taste. Overall good purchase for the price. Beautiful bed that is sturdy. It is a little low but we added a mattress topper to add some height to the bed. "How tall is the headboard? Thank you"
The headboard is 48 inches tall. "My mattress requires a platform bed with slats that are no more than 4 inches apart. Are the slats 4 inches apart or less? Thank you." "Can I still use a box spring with this bed if I wanted to? If so how would I do that?" You can still use a box spring, but it is not recommended. The slats provide the same support that a traditional box spring does for your mattress. To use a box spring simply place on top of the wooden slats. "Just want to verify measurements... Length (48in), Width (63in), Height (85in)???? Seems awfully high yet short?" "What is the maximum weight the slats can stand?" No, a box spring is not required. "Does this come in a king size too?" Unfortunately, we do not currently carry a queen size option.